Brunei: I saw the Sultan of Brunei! Yes people, I saw Sultan Hassanal Bolkiah of Brunei today! It's an important religous holiday in the Muslim world (the Birthday of Prophet Muhammad S.A.W. 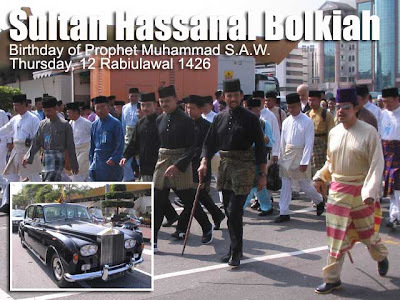 Thursday, 12 Rabiulawal 1426) and the Sultan himself and the male members of the royal family led a three-kilometer procession around Bandar Seri Begawan. It was good morning exercise for me since the procession was moving really fast and it was quite hard to keep up. I got good pictures of the Sultan and his Rolls Royce which was parked at the back of the Padang (these green marching grounds are the Malay equivalent of our town plazas). I'll upload them as soon as I get back to Manila. Funny as it may seem, my Bruneian friends saw me on TV! After the procession, I went back to Pusat Belia (Youth Centre) where I was staying, to rest after that long walk. The next thing I knew, it was 2 p.m. and it was time for another of those Indian dishes I missed so much, roti telur (flour pancakes with egg inside) and beef murtabak, with various curry sauce dips. Part 1: Hello from Kota Kinabalu! Malaysia: Hello from Kota Kinabalu!